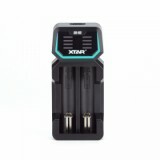 Xtar D2 2-slot Quick Charger is a new 2A Quick Charger for rechargeable 18650 batteries with 2-slot. 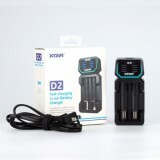 Together with the TC-CC-CV Three-Stage Charging, Buffering Technology, and Elaborate Heat Dissipation Design, the Xtar D2 2-slot Quick Charger will bring safe charging for you. 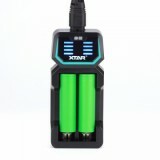 Xtar D2 2-slot Quick Charger is a new 2A Quick Charger for rechargeable 18650 batteries with 2-slot. 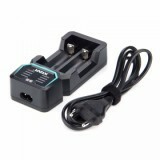 It can charge 2 Li-ion batteries at a time and is up to 1A by a single slot. 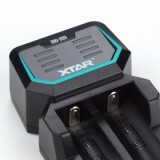 Together with the TC-CC-CV Three-Stage Charging, Buffering Technology, and Elaborate Heat Dissipation Design, the Xtar D2 2-slot Quick Charger will bring safe charging for you. 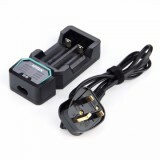 Plugs are available in the Edition of EURO, Australian, UK and US. 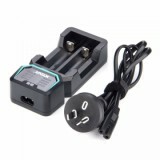 • You may need Li-on Batteries. 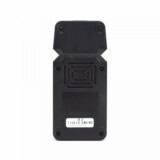 • Use at the range of 0-40℃. 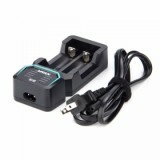 • You may have interest in other charging devices like Nitecore UM2 2-slot Quick Charger.